Golden Pheasant is a rare gated community located on the East-side of Tallahassee and features large homes that were mostly built at the height of the housing market back from 2004 through 2006. Today's report shows this neighborhood might be the hidden gem in NE Tallahassee. Our Golden Pheasant neighborhood report includes charts and graphs that display average home prices, home values, and home sizes, as well as all current listings in the Tallahassee MLS and all closed home sales in Golden Pheasant going back to 2004 when the first homes were built and sold. For each of the three real estate graphs found in this Tallahassee housing report, you will find the number of closed home sales for each year (red columns, measured on the left vertical axis), and an important real estate statistic shown in blue (measured on the right vertical axis. It is important to note that the narrative contained below is for sales through December for all previous years and through the second week in April in 2016. The graphs and the closed sales table will be continuously updated into the future (meaning bookmark this page if you always want to know the current status of homes in Golden Pheasant). It just so happens that we know of a homeowner in Golden Pheasant who is planning to move in the near future. If you would like to see this home before it hits the market (where everybody will know about it), simply CLICK HERE and let us know that you'd like to see the home. Average home prices in Golden Pheasant have hovered near $300,000 for the past four years, as numerous distressed properties have made these executive style home super affordable. The average home price now is 22% lower than what was paid in 2008, which is fairly common for larger homes in Tallahassee. Expect prices to recover strongly as distressed properties go the way of the DoDo. Home sales activity has slowed considerably since 2006, the year the housing market peaked and fell. The graph above demonstrates the textbook image for a "boom neighborhood," so homeowners will want to pay attention to local inventory levels. The average value of a home sold in Golden Pheasant in 2015 was $114 per square foot, but the one sale in 2016 reported a value of $121 per square foot. The low liquidity in the neighborhood requires us to see a few more sales before we can declare this an appreciating neighborhood. Bear in mind, if the distressed properties have completed, we will see home values on these relatively new homes jump. 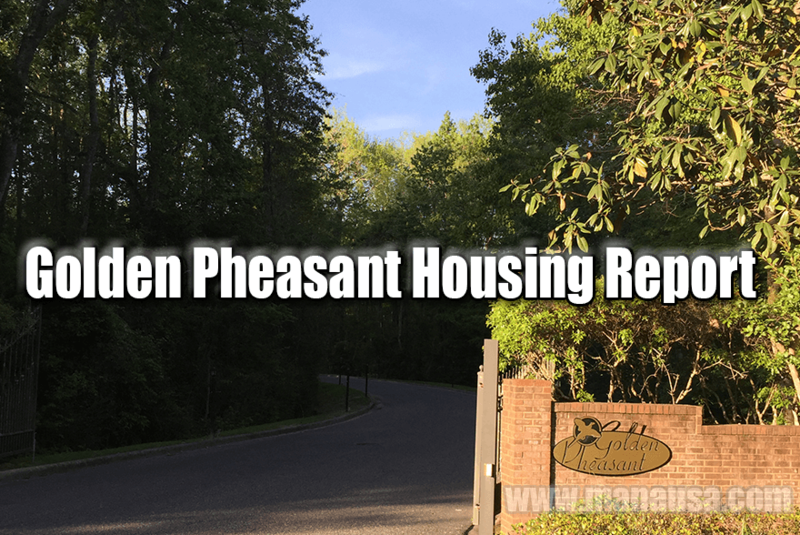 The average home size sold in Golden Pheasant typically falls in a range of 2,300 to 2,500 square feet, and recent buyers have selected homes at the top end of this range. The following list of homes are all of the Tallahassee MLS listings in Golden Pheasant. If none appear, it merely means that there is either nothing for sale or that the homes that are for sale are already "under contract" with a buyer. Don't let a good one get away! I hope you enjoyed our April 2016 update on home sales in Golden Pheasant, please feel free to drop me a note if you have questions not covered in this report.